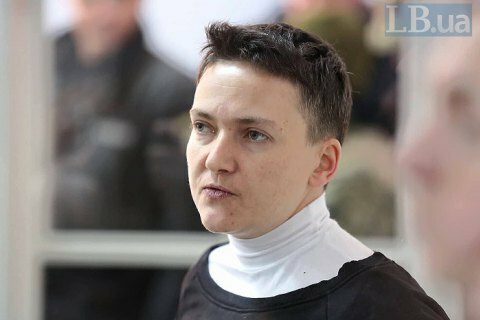 Kyiv's Shevchenkivskyy District Court on 18 April dismissed a request from military prosecutors to take a saliva sample from imprisoned Ukrainian MP Nadiya Savchenko. Military prosecutors wanted to analyse her saliva because some biological material was found on a mobile telephone they registered as evidence in her case. Savchenko's lawyer Dmytro Buhay challenged the request, saying it would denigrate Savchenko and violate her human rights. Savchenko, who attended the hearing, said she would regard attempts to extract biological samples from her as acts of torture. On 23 March, Kyiv’s Shevchenkivskyy district court placed MP Nadiya Savchenko into custody for two months and denied her bail. She is suspected of committing crimes under Article 109 Part 1 (collusion to seize power) of the Criminal Code, Article 14 Part 1, Article 28 p 3, Article 109 of the Criminal Code (preparations for violent seizure of power), Article 14 Part 1, Article 28 Part 2 of the Criminal Code (preparations for an attempt on the life of the president of Ukraine, MPs, the prime minister and other officials), Article 14 Part 1 and Article 258 Part 3 of the Criminal Code (creation of a terrorist organisation), and Article 258-3 Part 1 of the Criminal Code (abetting of the Donetsk People's Republic terrorist organisation).